It’s a little prickly on the feet but I love this rug!! It’s so beautiful!! I searched high and low for JUST the right natural rug. I wanted something quality, chunky texture and natural, but still soft underfoot. THIS IS IT! And such a great price, too! Arrived quickly, within 2 days. Packaged very well. Laid it out, vacuumed it straight away and very little dust or debris came up. The edges are nicely finished. Yes, I found a few sticks and open loops, but I expected that with a jute rug. Just pick out sticks (maybe 4 total) and either tuck back in or cut the open loops (do not pull). I'm so pleased with this rug. I wanted something natural looking but soft under bare feet. It is in the salon of our boat, and I just love how it looks. No smell, either. 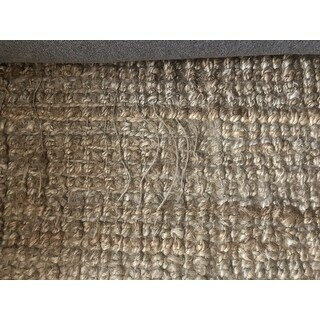 I highly recommend buying this rug pad, which just enhances the feel and comfort level underneath, plus protects my hardwood floor: https://www.overstock.com/Home-Garden/Mohawk-Home-Premium-Non-slip-Felted-Dual-Surface-Rug-Pad-6-x-9/5721587/product.html Have a good sharp pair of scissors ready to go, because the rug pad is generously sized and I needed to cut off about 3" on the length and about 6" on the width so that the ends would lay flat on the floor, otherwise you see the pad underneath the sides and ends. But with a sharp pair of scissors, it took no time at all. I'm super pleased and am going to buy 2 matching runners for the hallways next. Natural Sisal Rug by Safavieh! The colors of the rug and the feel of the jute underfoot. The colors are soft and work well with our existing wall colors and furniture. Even though the jute appears to be hard and uncomfortable to step barefoot on, it is surprisingly soft and gives a good foot massage! We are very satisfied with the 6x9’ rug and the price. beautiful color and soft and thick for a jute rug. Love! I love this rug! It is perfect in my neutral scheme. The color is amazing and a warm deep! I love the texture it adds, it has soul! It is a very natural item and if you arent into that look, dont order it! Dont vacuum with the brush bar on, just go over it with a bare floor setting. Walking on it is like getting a foot massage, it is very nubby but we love that! Here is something I realized though. If you dont want it to be quite so nubby, you can use it on the other side. I rolled mine out and was so happy with it. When my husband came home and I was gushing over it, he pointed out to me that it was wrong side out! I turned it over and I loved it even more!! But, it goes to show you that you could turn it over if the effect is a bit much for you or your feet. It may unravel a bit or get some pokey hairs but you wouldnt order a natural jute rug if you werent expecting that and love that look. 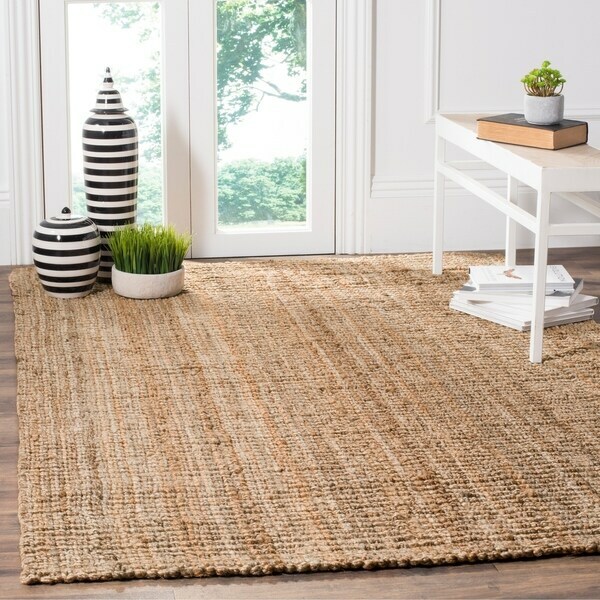 There are other jute rugs out there that arent as rugged, but I LOVE this look, I have the Shabby Chic/Industrial look in my house. Smell? maybe slightly at first, but didnt really notice it and I kept checking and asking everyone if they smelled it because I saw so much of that in the reviews. I have 4 cats and a large dog and they havent bothered it at all. I just purchased my second of this size rug. I have had the first rug for a year in my dining room and it has held up beautifully. It is thick and holds up well to my 2 cats and 2 dogs, who all love to sit on and sometimes scratch/bite it. It still looks good. I purchased a second one to go under my queen size bed and it seems to be exactly the same in size, color, and quality as the rug I purchased over a year ago. As far as the dirt/dust that other reviewers have mentioned, that is the dust from your house accumulating under the rug. Since there is no backing on jute rugs, you have to vacuum under it occasionally in order to remove the dust that falls through. Rugs with backings simply hold the dust inside of them. I will be purchasing more of these rugs in various sizes for my home. Very good value and not at all orangey. I love the casual look of this rug. The color is very neutral and it is soft to walk on. Great thickness. Excellent rug, worth every penny and then some! I was so nervous buying this rug sight unseen, but have never been happier. I have been shopping around for a natural sisal rug for about 6 months and decided that at this price point it was worth the risk. I was not to be disappointed. I would dare to compare the look, feel and quality of this rug to rugs that are twice as much. I didn't have the same shedding issues that some reviews stated. Being as its a natural fiber, I expected there would be more than there actually was (there was hardly any shedding). There was only a slight dried grass smell and it only lasted a day or two. It is quite soft to walk on. It has completely transformed the look of my living room! It was slightly darker in color but I think that only made it better. I would recommend this to anyone who may be a bit nervous or critical about buying online like I was. I just cant say enough good things, its worth every penny. It seems to be quite durable so far. I have only had it about a month, but being its in the most used room of the house and with 2 dogs I am happy with the quality so far. You got it right with this rug Overstock! Love love love it! This is the best and most naturally beautiful jute rug that I've ever purchased. The texture and color is absolutely amazing. If you love jute rugs, then this will not disappoint. Have this under the bed, so it only hangs out at each side. The side my husband gets out of bed on has begun to unravel... Literally the way it is woven, it is just falling apart. This part of the room receives traffic 2 times a day for less than a minute! He gets into bed, gets out of bed, bare feet...no reasonable excuse or explanation for the fact that it has fallen apart on that side. We had it for 1 month when this happened. There is also an unbelievable amount of dirt/dust that is coming off it, and has built up into a gray powder (superfine/abrasive) underneath. It will kill the hardwood shine, so it will need a mat underneath...if you are feeling lucky and order this, do not use it in a high traffic area (our zero-traffic area should be an indicator as to it's wearability), or anywhere you cannot lift it to vacuum underneath (the grass breaks down to dust when you walk on it even with socks), or without a mat. People with allergies to dust would go crazy with this...it is literally breaking down on its own, it would be weird and amusing if It weren't so big/expensive. I have babies...not so soft. When reading the reviews on these rugs one of the things that caught my eye was how soft everyone said it was. My rug came in yesterday and we laid it out. It is so pretty. I have two small children and we are ALWAYS on the floor. Sitting, crawling, laying. I don't think the other reviewers have small children or spend much time on the floor. if so, they actually would have said that the rug is very hard to the touch. It is hard on the knees, and it leaves stringy straw stuff all over your clothes. I am keeping the rug because it is pretty and my children won't be small forever. Great buy for the cost. By the way, the rug is made of 100% Jute, no Sisal. Jute is a natural plant fiber. Because of this the rug has a bit of a "dirt" smell. I assume it will go away with time. This rug is in our recreation room with lots of traffic. It has no signs of wear, even though it's been there for a couple months. It's definitely not smooth, so adds great texture to the room. I'd buy it again. Great size! Great Color! Perfect for under my dining room table! 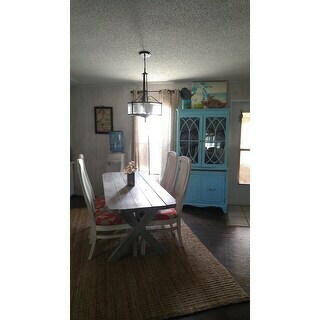 Love this rug put under dining room table love love it high quality beautiful thick great look! Falling apart after only 6 mo of normal living room use. Read reviews prior to purchase & thought maybe some were not familiar with how natural rugs wear/look. I was wrong. We have had a number of natural fiber rugs in our living room over the years, I have never seen one fall apart like this one, especially not this quickly. Others lasted 2-3 yrs without showing wear. A smaller version of this rug is in our daughter's room and seems ok, both bought at the same time. I would absolutely not recommend this to be used in anything but a bedroom. It was used normally, vacuumed regularly. Really disappointed. This rug is beautiful and thick. It's very heavy and should be aired out before brought in as the jute being rolled and wrapped in plastic, gets a slight smell. Shipped quickly however, seemed like it may have exposed to moisture prior to shipment (hopefully won’t be an issue) it is very large and thick like shown in the photo. Hoping it won’t shed or unravel like some others reviewers indicated. Perfect addition to my decor. This is not the first jute rug I have ordered from Overstock.com. I have 3 jute rugs in my home currently. I just love the look of these. This is however the 3rd jute I have bought for under my dining room table. Because they aren’t like any other rug that can be cleaned, overtime they lose their luster. What a great deal I got on this rug! It's huge! It used to just be a dream to own one, now it's reality! I accidentally ordered a different style than the runner I purchased first, but I love this carpet just as much if not more! What a difference having this rug on the floor makes in my sitting room. I am going to have to buy a few more! I love them, and Safavieh makes a good quality product! With the name Safavieh, I knew it would be made very well! The name has been around for quite a while! I love it! Thanks, Overstock.com for the great deal! I Love it!!! This rug is thick and stays in place under our bed! It brought all my colors together for an awesome Farmhouse! Also makes the room cozy! Looks great under coffee table. Easy to vacuum. Color is adaptable to all my color schemes. Soft, very pleasant looking with my furniture. "Is there a difference in Casual Thick and Chunky Thick?" The chunky thick rugs are textured with a chunky natural vegetable fiber resembling wool. "Does this rug shed a lot? I have another that sheds like crazy! I’m not worried about the dust...just the fibers. Thanks! " This rug may experience some shedding but this should diminish after a few weeks, and can be helped by regular vacuuming. "Is this rug sisal or jute? I'm hearing both in the reviews, listing says jute. I'm confused." I think it is jute because it is soft. this rug is amazing and it is the same rug that Pottery Barn sells at a fraction of the price. It is a nice thick Jute. I have had it in my dining room for about a year and have no complaints. I have not noted any shedding or the so called sand that others have complained about. I also have no pad under it because it is thick and secured by my dining room table. It is a nice thick jute. I have had it in my dining room for about a year and like it very much. I have not experienced the so called sand issue and do not have a pad underneath because it is thick, soft and secured by the dining room table. "I have read reviews about a sandy dirt coming out of rug. Is this natural to the product or is this just a coincidence? Have hardwood floors and am concerned about the sand." Our rug has been shedding sand for several months now. It is natural, but definitely need a pad underneath that goes all the way to the edges of the rug if you have hardwood floors. "Does this rug need a rug pad inderneath"
No...at least not in my house which does not have too much traffic. No, at least not in my house which does not have too much traffic. "can I get this in grey"
Unfortunately, it is not available in a gray option. 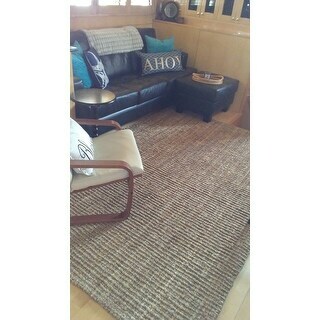 "Does the color of this rug match the color of the other Safavieh Jute rugs? I'm looking for a large rug and matching runners and the photos online make the products look like they are slightly different colors." Natural Jute has variations evebn within a sinmgle piece, but I bought this and a 22 ft runner and I find them to be "substantially" similar.